Many lessons can be learned from the life of Daniel. One of those lessons would be to trust God no matter our circumstances. Steve Farrar uses Daniel's life as an example in True Courage. In these uncertain times, it's easy to fear and forget that God is in control. But this book will remind us to keep our eyes not on what is seen... but on what is unseen. True Courage is the result of knowing God." And true courage is what we desperately need today. ﻿Living in uncertain times, having the unexpected happen, worries about how we will care for our loved ones... this book is a great lesson on focusing on God and knowing that He is in control. Like Daniel, we need to trust God and keep living life. I read Point Man by Steve Farrar years ago and loved it. 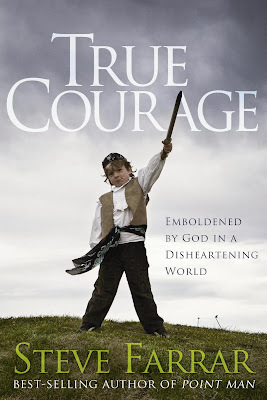 So, when I was offered the chance to review True Courage I was very excited. He is a great writer and speaker and has so much Biblical wisdom to share, I know you won't be disappointed when you read this book. I highly recommend it.